Mobile app development - Vensi, Inc.
Smartphones have become a connected device, that in today’s world most people cannot live without, whether it’s being connected to work, or keeping in touch with family and friends through phone calls, text or social media. The smartphone is a portable device that every person uses in their daily lives and has become completely dependent on it. The sensor technology that is on these portable devices is making our lives much easier to accomplish daily tasks. 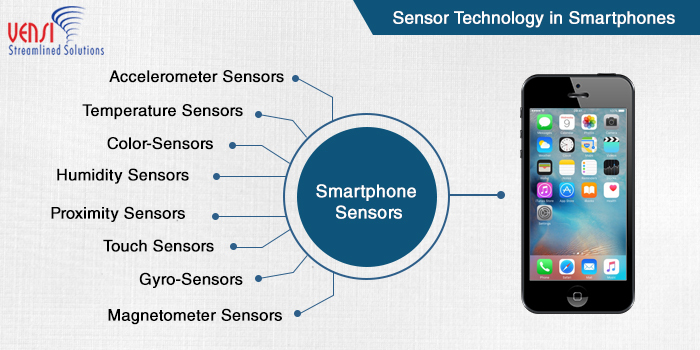 Sensor Technology in a Smartphone can vary from manufacturer, some have a large array of sensors while some are limited to their sensors. Having phones with a wide array of sensor technology makes using the phone much easier and enhances the functionality and features. 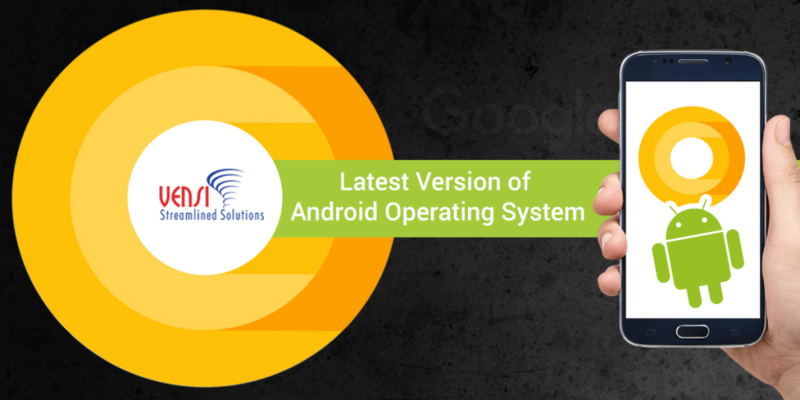 Equipping these devices with more high-tech features, users are now able to get more use out of the device. Users now can play video games, watch movies and get directions to the desired location these are just a few of the features that smartphone sensor technology can provide to make our lives more enjoyable. 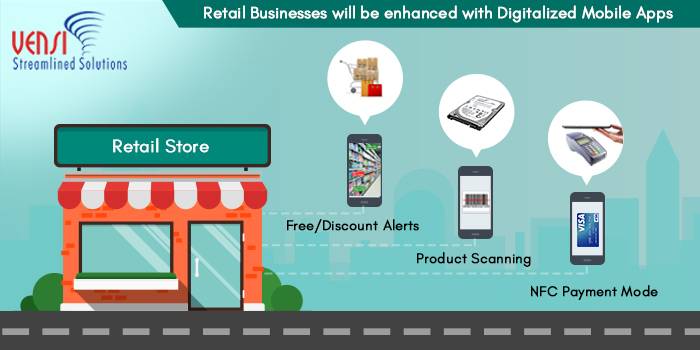 These Sensors are not only making our daily lives easier, but they are also used in marketing campaigns by large companies to get our attention with ads when we are in the vicinity of their target campaigns, like shopping in retail stores or grocery stores. 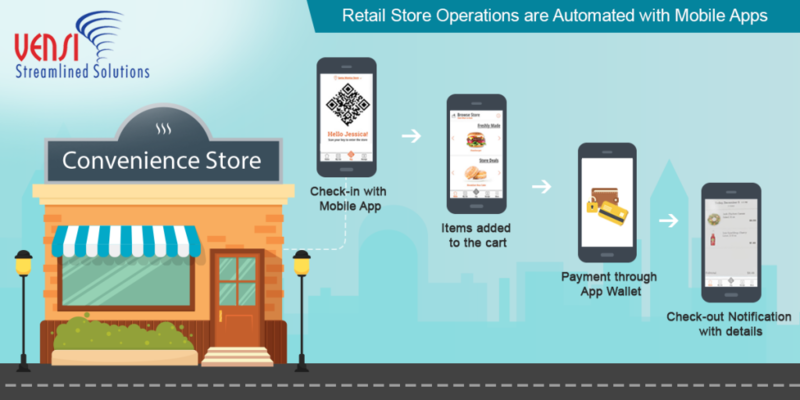 Most companies have mobile applications to inform and assist users in many ways while they are on the go. The sensor technology is also being used in Industrial Mobile Applications in many different scenarios to collect data and send it to a dashboard to be monitored, tracked, and analyzed. Some of the sensor technology in smartphones that are helping make smartphones an essential device for everyone and for every industry. 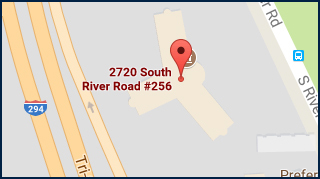 Tactile or Touch Sensors – Most phones use capacitive touch for a more accurate selection on a smart device. Proximity Sensors – Can time out a call when your phone is not placed near your ear, and also has developed swipe gestures with this sensor. Ambient Light Sensors – Adjust the brightness of the phone based on external lighting, to enhance visual. Gyro Sensors – Uses gravity to help determine position. Accelerometer – Uses non-gravitational acceleration, like vibration, rotation, and velocity, combined with a Gyro Sensor they are very powerful together. Magnetometer Sensors – Utilizes the modern solid state technology to create a miniature Hall-effect sensor that detects the Earth’s magnetic field. Temperature Sensor – Provide the temperature of the CPU, battery, and environmental temperatures. Humid Sensor – Check heat index, and also great for finding optimum food storage conditions, even preventing mold from growing in your home. Color Sensors – Use as a color meter, color matcher/analyzer, even pattern recognition. These sensors are used in smartphones to create a unique user experience with a lot of information in different conditions, without having multiple handheld devices. 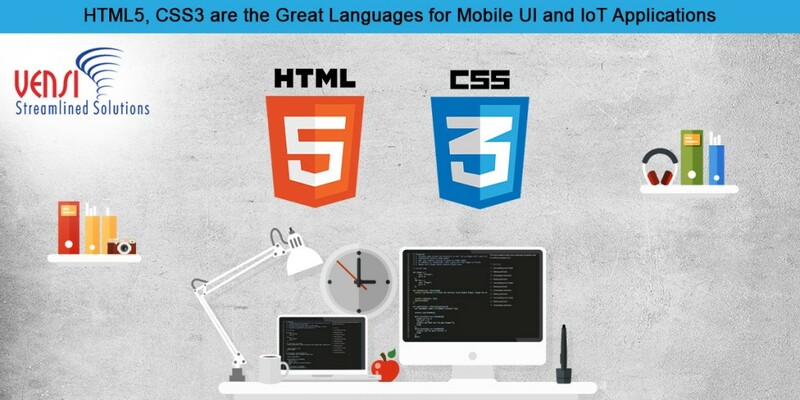 To bring out the best in these smartphones in useful daily applications, companies seek out qualified mobile developers that have experience in building these mobile applications to work with the sensor technology and mobile apps. 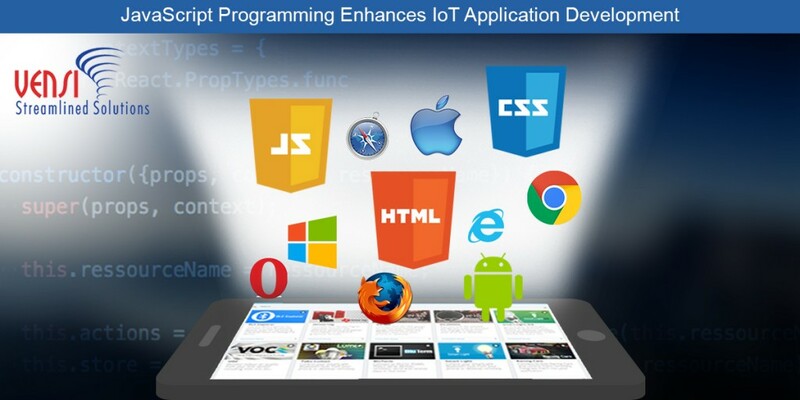 Vensi, Inc and its team of experienced and skilled developers are creating solutions using these sensors and if your team is looking to create mobile apps and sensor technology. In this age of new technology where the Internet of Things is the biggest topic of the day, there are other technologies that sometimes don’t get the attention that IoT gets, that doesn’t mean these technologies don’t have a great impact on our daily lives. Voice recognition is one of these technologies that is having great impacts in Smart homes, but even bigger impacts in Smart Industries by helping to streamline productivity in industrial environments where resources are limited. Voice recognition is the ability of a machine or program to receive and interpret spoken words and carry out the commands. Voice recognition is making head ways in Smart Home solutions with Google Home and Amazon’s Alexa these devices are making home automation much easier through voice recognition. These two products add intelligent voice control to any connected products to allow users to command home features like playing music, brightening, dimming or turning lights on or off, control television, heating and air controls and many other smart home controls. 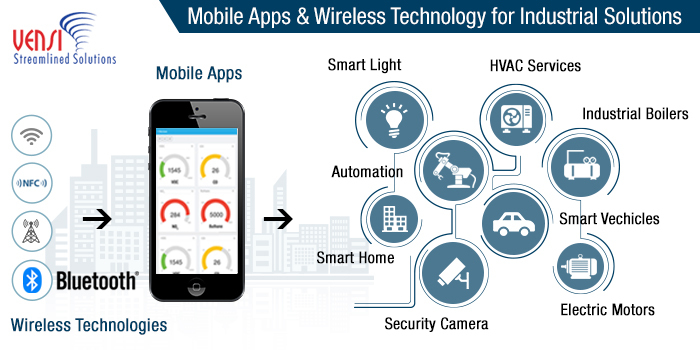 In today’s world of connected devices having hands free automation is adding another level to the connected device and Smart Industry Solutions, by taking advantage of new technology, a business can cut down on errors made by employees, saves money and also increases the productivity of their workers. This is providing adopters a crucial advantage in their markets and putting their business on the cutting edge of technology. Voice recognition has evolved in recent years in terms of speed and accuracy which is why residential and industrial industries are using them more and more to create industrial solutions to aid in the streamlining of the business. The most common scenario we see are users speaking into a device and having that information recorded, use cases like speaking into a device to type that data out for people with disabilities, this has been used for many years and is a great example. Voice recognition technology has endless possibilities. Machine to Machine communication in industrial automation is now being implemented in factories to increase communication and manage large amounts of data that is being generated constantly by the different processes of the machines working together in manufacturing industries. Voice recognition is also used in many cases for remote workers in utility companies who send out service technicians to inspect the difference work sites. The workers would normally carry cumbersome equipment around to log data from the different inspected sites to transmit that data back to a central office. Now with voice recognition, these service technicians can now easily log the necessary data by simply reciting commands. Companies are now installing electronics into the service men’s vests to minimize the hardware carried around that was once used in data logging. 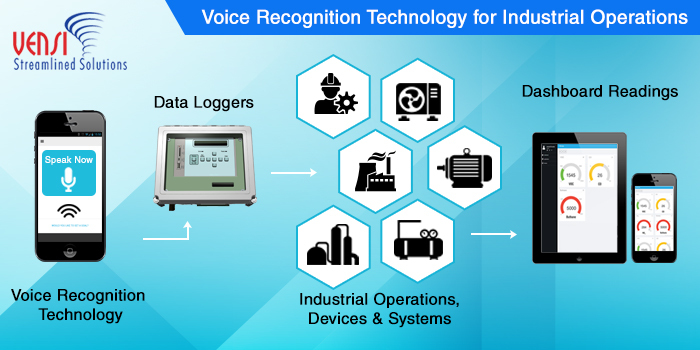 There are many applications for voice recognition in industrial environments that can facilitate streamlining business process, early adopters are using them to solve the problems that they face with user error and not having the resources available to them, these early adopters are leading the path to others seeing the value in voice recognition technology. Vensi, Inc has been working with voice recognition for many years and our team has developed solutions for our clients with our team’s experience if you’re considering a project and want to explore the possibilities of having voice recognition implemented into your project. The Industrial Internet of Things is seeing an increased interest in mobile apps by using rugged handheld units, and consumer-grade wireless technologies, to manage and control maintenance functions for remote locations. Wireless technology in the plant environment is now making a difference in improving the operations of industrial plant environments by creating smarter maintenance by monitoring of different aspects of the operations. Having mobile device on hand while working on the plant for is now become a critical tool for plant engineers to respond quicker. Laptops and emails were the first steps in creating mobility in industrial environments, but with smartphones and tablets, there is an even greater range of freedom to increase productivity. These wireless technologies untie area managers from control rooms and machines to monitor for better production. Managers are now able to not only see where the problem is but can get alerts where problems can potentially arise, while with real-time data can analyze where to increase capacity for better optimization with quick responses to the status of the plant. 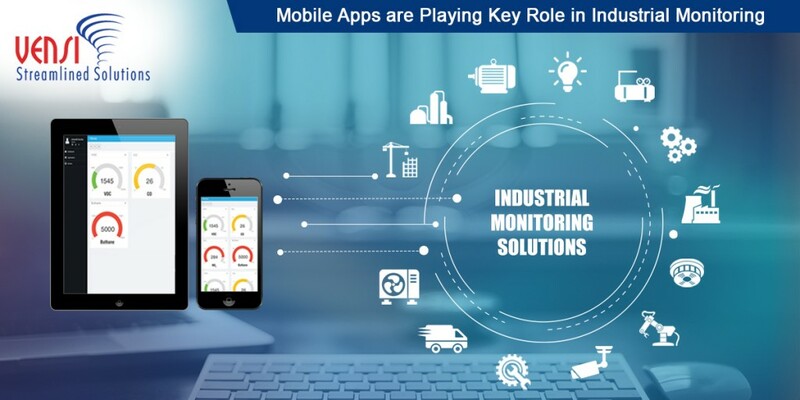 Mobile apps are becoming the standard in plants across the country and the world to monitor the entire production plant. 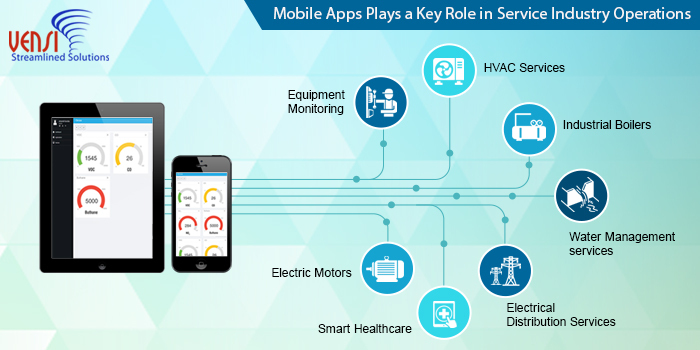 Now with the rise of the Internet of Things, companies are beginning to integrate existing systems into one app. This provides more analyzed data for managers to make better decisions on overall plant operations. The Internet of Things is the single factor in the 4th Industrial Revolution, this revolution is changing the way we live, work, and relate to one another this will be unlike any transformation man has known. The 4th industrial revolution is a digital one and is evolving at an enormous rate disrupting every industry in the world. This revolution is in it’s infancy stage, and with emerging technologies the possibilities are endless, companies are creating hardware and software that are creating innovative ways of gathering and tracking data. Vensi has created a unique hardware solution BluTerm that is preserving legacy systems and equipment by providing connectivity to them with Bluetooth adapters. These adapters convert and send Modbus, BACnet, 4 to 20mA and 4 to 10v signals to a smartphone or tablet and to the cloud for status updates, critical alert, and any pertinent data to be analyzed. Vensi’s BlueApp Solutions is a great way to get the remote connectivity and control from any industrial system or device, it’s not only simple to integrate but gives users all of the features they want and need. While others are still trying to figure out the Industrial Internet of Things, BlueApp is on the cutting edge of the Internet of Things technology.